Disclosure: I was sent a DVD to facilitate my review. Links are to my amazon affiliate acccount. The views expressed in this post are my own. Snow days are hard. Am I right? My school district closed for eight days. Since December, the kids have had more partial school weeks than 5-day school weeks. Several times we had 3-, 4-, and I think even a 5-day weekend. The first couple of snow days were fun. We slept in if a parent or a teen. We got up at the crack of dawn if you are a kid. We sledded. We had snowball fights. We drank gallons of hot chocolate. We had movie marathons. And the gaming was off the hook. There was MarioKart, Minecraft, and more. But…and I never thought I would hear my self say this, you actually can have too much of a good thing. By the fourth or fifth snow day, playing in the snow started to lose its luster. The snow was piled high. Walking down to our sledding hill was a trudge. Even my son was luke warm about playing outside. The snow had lost its appeal. We simply had too much snow. The days dragged on and on with no end in sight. The kids were arguing with each other over screen time. All the time. My husband and I had to demand that the kids give up the “good” TV so that we could watch our shows. Even our traditional family movie marathons seemed like a drag after were spending the whole day doing watching TV. There was no other choice but to assign chores. One kid folded towels. Another loaded and unloaded the dishwasher. My husband took care of a computer backup issue. I sorted and purged files and files of bills. My youngest got the sweetest chore of them all. He got to watch movies! We’re a blogging family. I blog here. My husband blogs here. One daughter has a tumblr. One daughter has an instragram. My son even has a blog! With a stack of DVDs waiting to be reviewed, I drafted my son to be the Chief DVD Reviewer. He LOVED his chore…not so much the rest of us! Here’s my son’s review of Transformers Prime: Ultimate Bumblebee. He did a great job! These four shows are, Masters And Students, Operation Bumblebee Parts 1 And 2, and Deadlock. Masters And Students, is about how Megatron (former leader the of Decepticons) perished and the Decepticons found a new leader, Skyquake, but is Megatron still alive? Watch to find out. I liked it because it has a lot of action and drama. The Second show, Operation Bumblebee part 1 is about how Megatron is looting Autobot Relics, but the auto bots catch them and secure a Relic, the spark extractor which is deadly. But Bee’s “Teacog”, which is what he needs to transform into vehicles was taken by “Mech”, who is not a decepticon or autobot he is human… Anyway I liked ththis video because whenever Optimus and Megatron fight it is epic. The Fourth video, Deadlock, is about how megatron wants to harm earth and the Autobots want to stop him but the Decepticons fight back and the autobots find themselves trapped in the Decepticon starship. I like THIS one because it has characters that I’ve never seen before. You can purchase this DVD on amazon for $9.99. Transformers Prime: Ultimate Bumblebee DVD is from the Hasbro Studios’ Emmy® Award-winning series Transformers Prime! Bumblebee is a dedicated warrior and a scout who serves as part of the elite squad lead by Optimus Prime. Though he may be one of the smallest and youngest of the Transformers, don’t let that fool you. Time and time again, this Autobot proves that he has the bravery to fight for what is right and the tenacity to throw himself into action to battle against his opponents no matter where they appear. 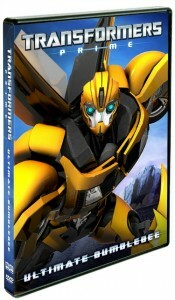 This DVD — in stores now — features a collection of the four best Bumblebee adventures from the Transformers Prime lore. Packed with visually stunning CG animation and unforgettable characters, this new DVD delivers fun-filled home entertainment that kids and parents will enjoy! The four action-packed Bumblebee adventures include: Masters and Students; Operation Bumblebee, Part 1; Operation Bumblebee, Part 2; and Deadlock. The DVD features the voice talents of Peter Cullen, Frank Welker, Josh Keaton, Jeffrey Combs, Kevin Michael Richardson, Will Friedle, Sumalee Montano, Ernie Hudson, Markie Post, and Steve Blum. The Transformers Prime series airs on The HUB TV Network in the U.S. and on Teletoon in Canada. Hasbro Studios is the Los Angeles-based entertainment division of Hasbro, Inc. The studio is responsible for entertainment brand-driven storytelling for the company across television, film, commercial productions, and short-form. It develops, produces and distributes TV shows based on Hasbro’s world class brands, including Transformers, My Little Pony, Littlest Pet Shop, and Family Game Night. On the film side, the studio is developing and producing a number of features based on Hasbro’s brands, including Transformers: Age of Extinction (Paramount), G.I. Joe 3 (Paramount), and Candy Land (Sony).